AGARTALA, India -- A rare Buddhist statue that should have been preserved in a national museum has become a casualty of the Indian obsession with piety and the general indifference to the Archaelogical Survey of India. The 18-handed Mahayana statue, from about 8th century, was placed in a Hindu temple, Raj Rajeswari inaugurated at an obscure village, Muhuripur in Belonia subdivision in South Tripura last week. The Buddhist idol is now being worshipped by Hindus and the Archaelogical Survey of India (ASI) is finding itself "helpless" to intervene. 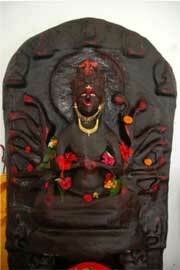 "The statue was found in the area about 70 years ago and was housed in an Akhra run by a Sanyashi Harananda Giri. Later the Devi was worshiped by his disciple Radharani Bhairabi as 'Raj Rajeswari'. We recently formed a committee and built a temple and brought the idol here. The six feet tall idol was more than one ton in weight and we had to use bulldozer to bring the deity here", said Rakhal Datta, secretary of the Committee. According to the experts, this statue is perhaps the most ancient among all the idols that are being worshipped in temples across India. "As far as we know there is no other deity with 18 hands except this one," said Dulal Ghosh, a social worker who has independently studied this subject. Besides this, "there are three 16-handed deities-one in Ashutosh Museum of Calcutta University, one in Tamil Nadu and one in Cambridge, which is, however, a painting. There is also one 12-handed deity in Keshpur at Bangladesh. In Nepal, there is one 20-handed Devi idol", said Dipak Bhattacharjee, an expert on the subject. "But none of all those deities are in any temple or being worshipped. They are in museums", he pointed out. Muhuripur village forms a part of Pilak -an ancient seat of Buddhist and Hindu religious activities and also an extension of Buddhist sites of Paharpur, Maynamiti, Chottogram (all in Bangladesh) and Burma. Pilak is already an archaeological site and tourist destination where several idols and ancient structures have been discovered since 1927. The archaeologists date back the site to 6th to 7th century. "The Pilak site was actually a part of Samatat kingdom of ancient Bengal, now mostly Noakhali and Comilla districts of Bangladesh opposite to Tripura. The area found mention in the writings of Chinese pilgrim Hiuen Tsang who travelled this area during 637-39 AD. Seventy years later one more Chinese pilgrim Tsen Chi described that Buddhism had by then become the main religion of the region where at least 4000 Buddhist monks used to run several institutions. In fact, copper plate issued by Maharaja Bainygupta in 507-8 AD found at Comilla stated that Buddhist Mahayana sect were allotted land", said Dipak Bhattacharjee. Pilak, divided in three parts-West Pilak, Central Pilak and East Pilak- is a treasure trove of ancient history and artefacts. The Archaeological Survey of India has also got one unit here. But locals allege that ASI was not serious enough to protect the site. "When Pilak's idols were found and people became aware of their importance, they just took away many of the artefacts to their houses. All these archaeological artefacts became their personal properties. Neither ASI nor any other agency seems interested to collect these priceless ancient treasures for preservation," rued a government official of Belonia subdivision. The lackadaisical attitude of the ASI or other government agencies is obvious. As most of the idols are made of sand stones, they have been destroyed over the time due to lack of proper preservation. Therefore, most people have developed indifference towards ASI given their poor record in the region. "Look at this priceless and unique Chundi idol. It was housed in a small shanty and smoke-filled room for 70 years as the Sadhus unaware of its importance kept on burning incense sticks, pasted 'sindoor' and offered all kind of pujas", said Bhattacharjee. T.J. Baidya, Superintending Archaeologist of ASI Kolkata Circle also confirmed that the statue was very likely from 7th-9th century. He said the statue with 18 hands was "indeed rare." "This idol you mentioned could very well be from anywhere between 7th to 9th century, he told TOI over telephone from Kolkata. Baidya, however, added that ASI could not take away the idol for preservation due to religiosity that had already been attached to it. "If idols are found and then people start worshipping them, we are helpless. The ASI cannot take away such idols for preservation in absence of a requisite mandate", he said.